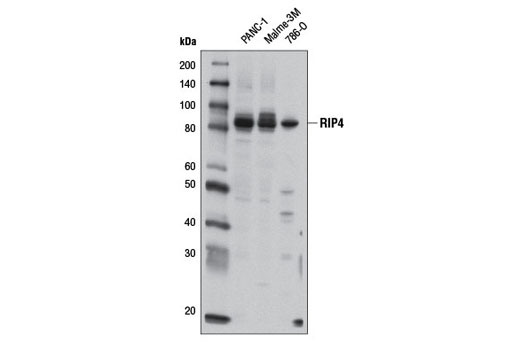 Western blot analysis of extracts from PANC-1, Malme-3M, and 786-O cells using RIP4 Antibody. 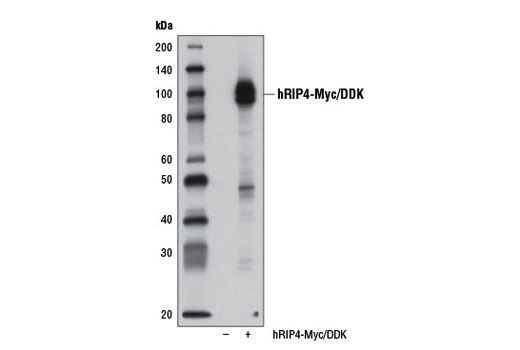 Western blot analysis of extracts from 293T cells, mock transfected (-) or transfected with a construct expressing Myc/DDK-tagged full-length human RIP4 isoform 2 (hRIP4-Myc/DDK; +), using RIP4 Antibody. Immunoprecipitation of RIP4 from PANC-1 cell extracts, using Normal Rabbit IgG #2729 (lane 2) or RIP4 Antibody (lane 3). Lane 1 is 10% input. 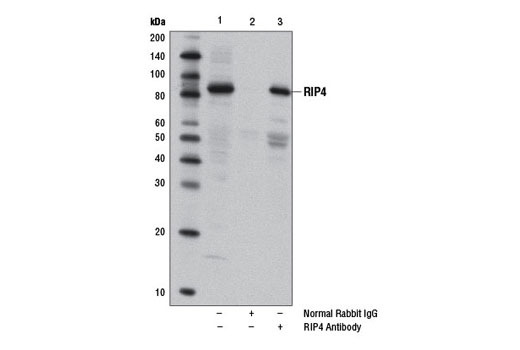 Western blot was performed using RIP4 Antibody. Mouse Anti-rabbit IgG (Conformation Specific) (L27A9) mAb #3678 was used as a secondary antibody to avoid detection of IgG. RIP4 Antibody recognizes endogenous levels of total RIP4 protein. Polyclonal antibodies are produced by immunizing animals with a synthetic peptide corresponding to residues near the carboxy terminus of human RIP4 protein. Antibodies are purified by protein A and peptide affinity chromatography. The receptor-interacting protein (RIP) family of serine-threonine kinases (RIP, RIP2, RIP3, and RIP4) are important regulators of cellular stress that trigger pro-survival and inflammatory responses through the activation of NF-κB, as well as pro-apoptotic pathways (1). In addition to the kinase domain, RIP contains a death domain responsible for interaction with the death domain receptor Fas and recruitment to TNF-R1 through interaction with TRADD (2,3). RIP-deficient cells show a failure in TNF-mediated NF-κB activation, making the cells more sensitive to apoptosis (4,5). RIP also interacts with TNF-receptor-associated factors (TRAFs) and can recruit IKKs to the TNF-R1 signaling complex via interaction with NEMO, leading to IκB phosphorylation and degradation (6,7). Overexpression of RIP induces both NF-κB activation and apoptosis (2,3). Caspase-8-dependent cleavage of the RIP death domain can trigger the apoptotic activity of RIP (8). Receptor-interacting serine-threonine kinase 4 (RIP4, ANKRD3, DIK, PKK, or RIPK4) is a membrane-associated, ankyrin repeat-containing member of the RIP family first identified in HaCat cells (9,10). RIP4 has been shown to be involved in keratinocyte differentiation in vivo as well as wound repair (11-13). Studies indicate that siRNA knockdown of RIP4 in human xenografted tumor cells suppresses Wnt-dependent growth while over-expression of RIP4 in vitro stabilized β-catenin and lead to an increase in Wnt-dependent gene expression (14). Meylan, E. and Tschopp, J. (2005) Trends Biochem Sci 30, 151-9. Hsu, H. et al. (1996) Immunity 4, 387-96. Stanger, B.Z. et al. (1995) Cell 81, 513-23. Ting, A.T. et al. (1996) EMBO J 15, 6189-96. Kelliher, M.A. et al. (1998) Immunity 8, 297-303. Devin, A. et al. (2000) Immunity 12, 419-29. Zhang, S.Q. et al. (2000) Immunity 12, 301-11. Bhr, C. et al. (2000) J Biol Chem 275, 36350-7. Chen, L. et al. (2001) J Biol Chem 276, 21737-44. Rountree, R.B. et al. (2010) J Invest Dermatol 130, 102-12. Adams, S. et al. (2007) J Invest Dermatol 127, 538-44. Holland, P. et al. (2002) Curr Biol 12, 1424-8. Huang, X. et al. (2013) Science 339, 1441-5.